IMPORTANT: This utility is only for use with the products identified and sold in Australia. Not all models are sold in all countries. 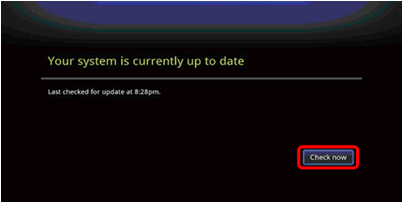 This update is only available directly through the NSZ-GS7 Network Media Player. It is not possible to download and install this update using a USB device. Please see Check the Current Firmware Version to see if the Network Media player has already been updated, and select Network Upgrade Instructions if the Network Media player has not been updated. Power ON the television and make sure it is tuned to the inputs to which the Network Media player is connected. Power ON the Network Media player. Wait until the Home menu is displayed on the television before proceeding. Use the arrow and ENTER keys on the remote control to select All Apps → Settings → About and then press the ENTER button. 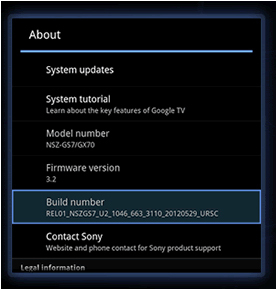 The version of firmware installed on your device is shown as the Build number, and has a format as shown below. Near the end of the build number, just before _URSC, will be an eight digit number format (YYYY/MM/DD) which indicates the date of when the firmware was created. If the release date on your device is older than the release date of the latest firmware, an update is available. The NSZ-GS7 Network Media player firmware can only be upgraded by performing a Network Upgrade. If you have not done so already, please check the current firmware version to determine if this firmware upgrade is needed for your Network Media player. WARNING!! Please follow the upgrade instructions carefully. Failure to follow the instructions may interrupt the upgrade process and may cause the Network Media player to be unresponsive or to require repair. WARNING!! Do not power off the Network Media player or disconnect it from the AC power outlet. Loss of power during the installation of the firmware upgrade may cause the Network Media player to be unresponsive or to require repair. In order to perform the network upgrade it is necessary to have the player correctly connected to an active Internet connection. Select Check now, and then press ENTER. Note: If the message says Your system is currently up to date, your Network Media player has the latest firmware. 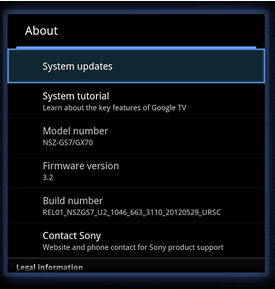 If a firmware version is shown, an update is available. If an update is available, select Download, and then press ENTER. Note: Please wait until the download step is complete. The download time may vary depending on network bandwidth. 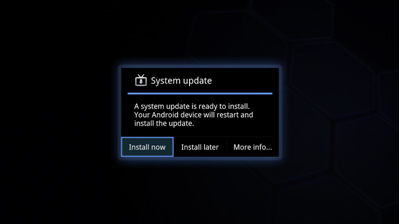 After the download step is completed, the upgrade confirmation dialog will display. Select Restart & install, and then press ENTER to begin the installation. The Network Media player will automatically power off and begin the installation process. 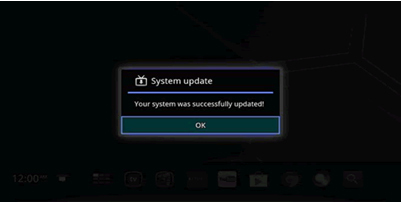 The Network Media player will automatically power on after the upgrade is complete and the upgrade completion dialog box will display on the television. Make sure OK is selected, and then press the ENTER button. Note: The Network Media player automatically checks for firmware upgrades while the player is in standby mode. The upgrade confirmation dialog will be shown when an upgrade is available. The Network Media player is designed to resume the upgrade process after the power has been restored. If the Network Media player becomes unresponsive, please contact Sony.